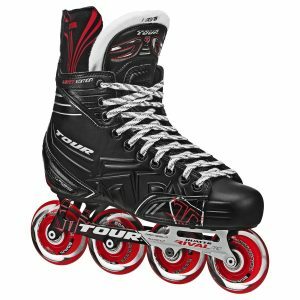 Best Inline Hockey Skates 2019 – If you are looking for a good pair of hockey roller blades and has not found the right one yet, don’t you worry. 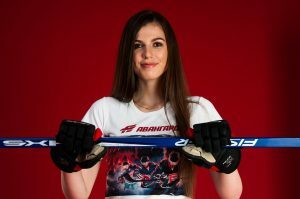 Let us do this for you as we are going to introduce you to the top 5 best inline hockey skates regardless of what level of player you are. 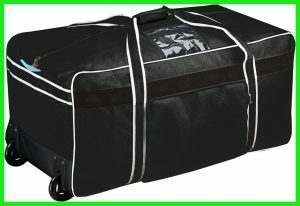 We covered skates for all those beginners to pro level hockey players. So stay tuned till the end of this guide so that you find the skates as per your feet and other sports requirements. 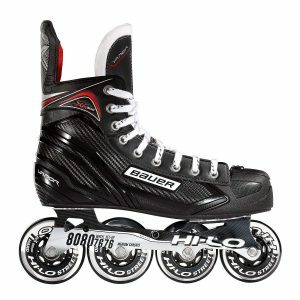 The Bauer Vapor XR 300 hockey skate comes with high low 82A wheels holding ABEC 5 bearings which are connected to the high-low aluminum 2-piece ventilator frame to achieve more durability. It is going to be the 80-millimeter setup in the back and 76 millimeters in the front in order to give you a nice aggressive stance all connected to the injected composite weave boot that’s inspired by the prodigy skates. Because of just how well it is able to support a player’s foot while also giving them a really nice anatomical shape and feel. 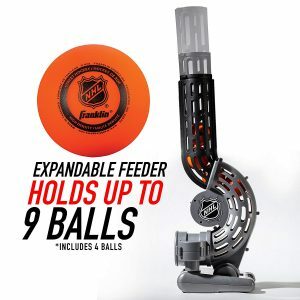 This hockey rollerblade is thermal adjustable so you can get the foams on the inside of the boot to form around the foot to reduce break-in time and for a more personalized fit. It features a two-piece anatomical white felt tongue stitch down through both sides of skates that offers a nice anatomical wrap around the shins does have some nasty flop to it as well. 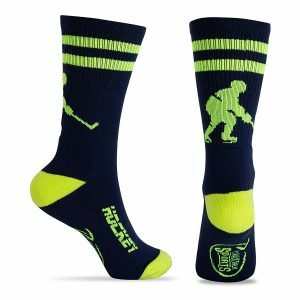 Its microfiber liner is really soft to the touch so even perfect for players who don’t like to use socks when they skate but it helps to wick away moisture to keep your feet dry all game long. Then for the volume, it is low volume hockey skate that has minimal rap and a low overall instep volume so you will have a really nice shallow ankle. 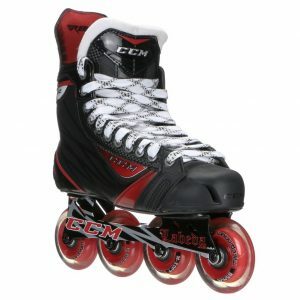 The CCM RBZ 80 roller hockey skate features one of the most popular Labeda millennium wheels which provide great traction. Inside of these wheels, CCM use Labeda ABEC 9 bearings which provide you great roll and all 80-millimeter wheels are going to be sitting in the Labeda one-piece high-grade aluminum frame. So it is going to be nice and lightweight but it is also going to be very strong. Looking at the outsole, it is embossed plastic molded outsole that is a big upgrade throughout the rest of the line. It could be a little stiffer making the energy transfer process a little bit smoother. Also, CCM came out with a quarter package upgrade you will see in these skates with a sublimated tech mesh definitely noticeable more stiffness from the previous CCM 70 roller skate. So another nice upgrade as well as you will see some nicer and more durable aesthetic features throughout the skate. Now talking about its toe cap that is something that we don’t see in the ice boots from RBZ’s or the RBZ line. 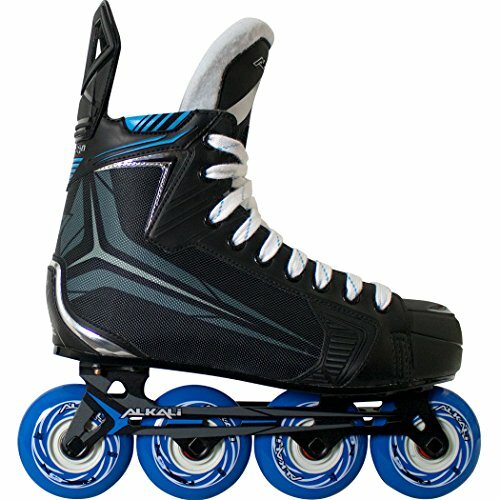 This roller blade also has some nice big air vent holes that provide great airflow when you are playing in the game keeping your feet cool. It features a solid two-piece white felt tongue that is pretty thicker so you will have some lace bite protection up through the top. You can flip it if you need to or you can give a nice anatomical fit under the shin guard. Moreover, its heavy-duty microfiber liner has a really soft touch to it that helps push the moisture down through the boot keeping your feet dry. The Alkali RPD Recon hockey skate comes with indoor wheels holding out clay ABEC 7 bearings all sitting in the one-piece stamped and extruded aluminum chassis really great feature to see typically find a two-piece at this price point. This is being much more durable and it helps to transfer energy a little bit better as well. It is connected to a PVC maximum power transfer outsole that is a really unique feature because there is a cavity near the second wheel to the front that allows the chassis and the wheels to sit closer to the bottom of the boot. So this lowers your center of gravity giving you better agility as well just a better overall balance. Into the quarter package, Alkali uses nice traditional pro nylon for good level stiffness at this price. There are abrasion patches on both sides inside and out of the quarter package so players who are using it outdoors give them a little extra durability. Also, this Alkali hockey inline skates feature comfort edge wraps up at the top just adding a little bit of comfort alleviating high ankle abrasion. New cool feature for alkali skates this year is the injected tendon guard along with windows on the back so makes carrying the skates super easy and very intuitive but the full injected piece is more durable and long-lasting as well. Its features a two-piece pro level thick tongue with ticking the injected foams down through the center. 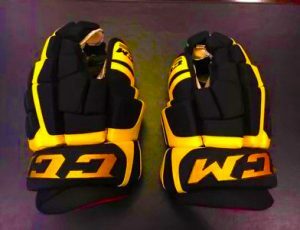 The vents are very roller specific for the perforation just allowing good airflow to keep a hockey player cool and the nice extra thick padding down through the front offers good protection from pucks as well as lace bite. Into the liner, it is just traditional brushed nylon very soft to the touch that can do a good job of wick away that moisture to keep your feet dry. These skates do have some nice large ankle pads really thick again at this price point so cool to see. they are so very comfortable which help to lock the heel. For the fit profile, this is a high volume skate that has a nice wide forefoot but they did a good job this year of really improving on the heel lock keep it planted for the weight in the senior size 914 grams. Now we are going to look at Tour Fish Bone Lite 725 ice roller hockey skates. 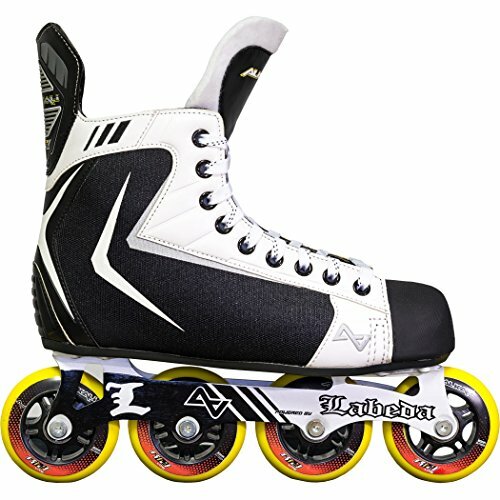 Like other hockey roller skates, it also has Labeda millennium wheels which are great for indoor use giving you a lot of grip and speed. Working with that is an upgrade with the Bevo ABEC 9 bearings. It is all sitting in Tours new rival aluminum and magnesium frame that is lightweight so it gives you an overall lightweight design but the aluminum gives you a lot of strength in there as well. It is connected to the DPS injected plastic outsole. This is a tour specific design because it allows the front two wheels to recess into the outsole. 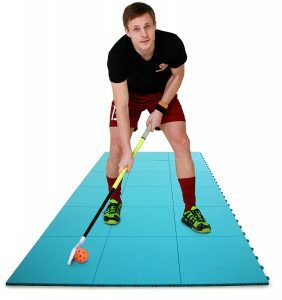 This, in turn, lowers the overall height of the skate which lowers your center of gravity so really gives you better stability as well as balance. Into the quarter package, this is going to be their tough skin light package that is a huge jump in stiffness from what they used in the rest of the line underneath this. So when you are taking your stride, you are getting more power through each stride. 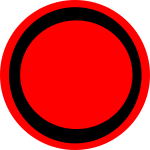 But the big thing to note is that this is a really durable shell casing so that is able to withstand without separating. 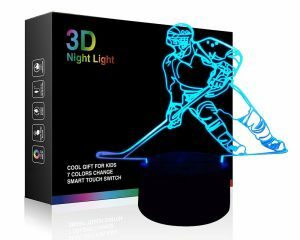 Its tongue is a really great key feature at this price point because it is the same thing that you find in Tours top-of-the-line skate. This is what they call their Ridge Regression. It is a traditional sewn together two-piece white felt tongue so gives you a nice anatomical wrap under the shins. They use heavy foam reinforcements all the way throughout so it makes for a really comfortable feel on the top of the foot but more importantly, it gives you really great protection from slashes as well as pucks and also does help to prevent lace bite as well. 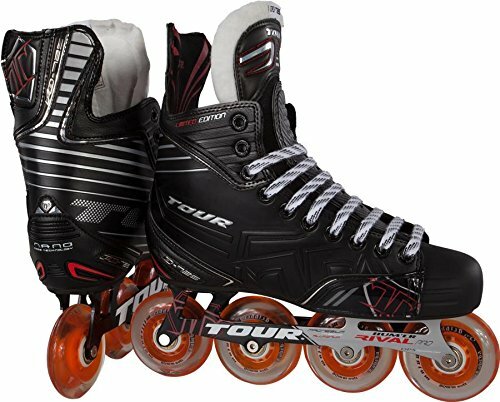 The Tour Fish 725 roller blades feature AHM 8600 liner that offers nice almost velvet feel to it. At the inside bottom, we can see the foams which are for good heel lock and added comfort. The Alkali lite R skate is the last but not least in terms of quality and performance on our list of best inline hockey skates. 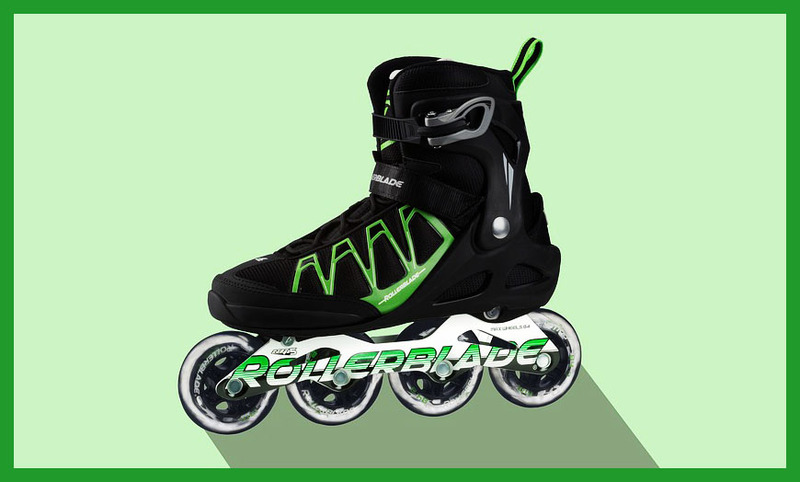 These skates have G28 outdoor wheels which allow you to go on rough outdoor surfaces. They also hold a Beck 7 bearings for a good roll and good durability. These are all sitting in the Labeda one-piece stamped aluminum chassis great feature to see out of such an opening price point because most of them are going to be the two-piece that is not as durable or as stiff and rigid. There is an injected TPR outsole that allows the second wheel to recessed into the outsole. This lowers your center of gravity so allows you to get a little more balance and fuel out there. Its lightweight nylon quarter has some fairly good stiffness but it is that opening price point so that is what you cannot expect is its full heat moldability that offers you that customized fit. Before you even start breaking them in for durability and especially for using them outdoors, they do have those wear patches on both the outside and inside of the boot. As far as the tendon guard goes, it is fairly stiff and traditional so it’s not going to be too flexible like you would see in some other skates but does have a nice traditional fit and feel. Continuing with traditional two-piece 7-millimeter white felt tongue that is stitched together down through the center so that gives you some nice wrap up under the ankles. If you go under the shin guard, they did inject some foams down through the center as well so it offers additional protection for the top of the foot. Into the liner that’s what they call their tack light liner that is a really soft feel to it. It helps to wick away moisture just to keep your feet nice and dry. Deep down inside, you will see hyper lock L pads. They are not as pronounced as what we have seen in some of the higher-end skates but it will really help to lock down your foot making sure you don’t get in the heel slippage.